“I worked for a company and a woman requested to be contacted for a demo. It was assigned to me. I reached out and she said that she had an emergency and she wanted to do demo next week. I wished her well and asked if I should just delete her request so she wouldn’t get contact and she could resubmit when ready. She said “No it’s fine, we would do demo next week.” A couple days later, I was going through files and realized that one of them was a referral and got a free month and texted to let them know. The account was not flagged for no contact so business as usual. Well, she responded that since I contacted her before the next week, that she wanted a year free of service. I googled her at that point to find out who she was and it turns out that she harasses companies, gets people fired to get free things, creates fake Facebook sites of dead soldiers and dying children to get followers and then switches it to her name, even takes charitable contributions. She stalks celebrities and common people and when they try to defend themselves, she threatens to ruin their lives, creates accounts in their names and does all types of things. I apologized and explained that I am a mother of two and the sole supporter of my family. She said “Guilt trips don’t work on me sweetheart” and posted my comment on Twitter and ripoff report saying my company’s name and my name. Saying that I harassed her and that the company gives terrible customer service to their clients. I had been with the company for almost 3 years, was a top rep and never had a complaint after dealing with thousands of clients. We had just gone public and I was fired because of it. Then my company gave her 3 months of free service. I was all alone, I had just moved to a new state (next to my parents) because my company said I couldn’t work in the state my parents lived in. I had earned the privilege to work from home because of outstanding work and I was left all alone, jobless, in a house I just moved into 2 weeks prior with two babies and no job. All because she posted a ripoff report on me and my company. She was not a client and requested contact. Now, potential clients google my name and that comes up on the first page. New companies that I would like to work for google my name and find that. I have nothing but positive things about me online and then an Internet cyber stalker ruined my reputation in order to get free service and cost me my job using this site. She has about 30 ripoff reports from her victims about her and she was allowed to post there still. Then I look and to even have them look into the situation, they want 2 grand. It should be illegal. It is immoral, irresponsible, defamatory, unethical and slanderous. It should not be legal for people to use a site like this to extort money from small business or to so easily put up slander. There is no legality or credibility or even an attempt to see if this information is true. People work very hard to create businesses and careers and a loser that has no job and supports themselves by robbing, conniving and stealing can tear years of hard work down with a few clicks of a keyboard. And the victims have no defense. It’s just there. Consumers don’t know if they are true or not but I know that if I send a potential client an email for whatever company I represent, until this post is down, they will google my name and find this. By becoming a member of the Corporate Advocacy Program, no matter how you search your name on search engines, it will all look as it should. Positive. Just as long as the member business lives up to their stated commitment to customer satisfaction and always take care of complaints quickly… always making it right with their customer, going beyond the call of good customer service… Member business listings will be POSITIVE and should be at the top of search engines. Click on the actual links below to see for yourself. Consumers love to do business with those that can show how they took care of their customer. We all make mistakes. How a business takes care of those mistakes and shows how they took care of their customers is what separates good businesses from bad businesses. Ripoff Report Verfied™ .. part of Ripoff Report Corporate Advocacy Business Remediation & Customer Satisfaction Program. A program that benefits the consumer, assures them of complete satisfaction and confidence when doing business with a member business. ..yes, a long name for a program that does a lot for both consumers and businesses alike. The only way to get things off of RipOff report is to join their cult with lots of money. After helping thousands in the Real Estate world with a following of…. In May 2013,my husband and I learned about Bill Twyford’s coaching program at a DC-REIA event in Upper Marlboro, MD. We Paid $9,995 for what was represented as “expert instruction” in the areas of foreclosure, short sales, and distressed real estate investing. The reality is that the finavcial advise we received was at best uninformed and at worst, dangerous inasmuch as it exposed us to serious fines, liability, and even jail time given the laws of the State of Maryland and under Federal Laws such as the Protection Of Homeowners In Foreclosure Act (PHIFA). Bill Twyford is newer available on the phone or via e-mail, as he is ” too busy” doing his coaching. He refuses to give refunds back even though he promises to do it. Completely deceptive business practices and wrong adwise expose them as non quolified advisors who may never practice what they pritch. He still charges my credit card for 3 months in the raw after cancellation- what is consumer fraud and credit card fraud.I would strongly advise anyone who are considering buying any of their programs, to do your own research. This great review is on RipOff Reports site, but for some crazy reason is not on the front page when searching for us? I am and have been a full time investor for over 10 years. 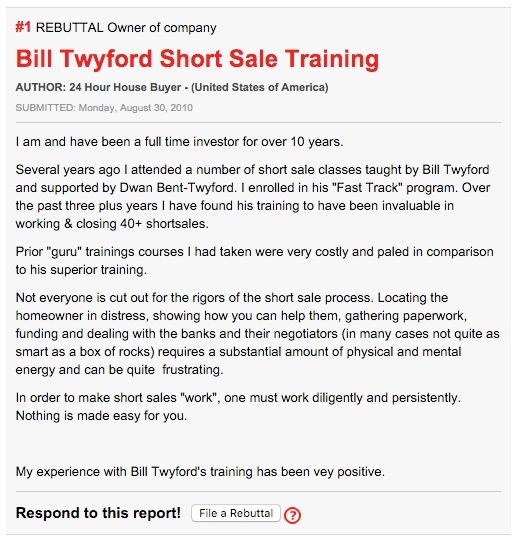 Several years ago I attended a number of short sale classes taught by Bill Twyford and supported by Dwan Bent-Twyford. I enrolled in his “Fast Track” program. Over the past three plus years I have found his training to have been invaluable in working & closing 40+ shortsales. Prior “guru” trainings courses I had taken were very costly and paled in comparison to his superior training. Not everyone is cut out for the rigors of the short sale process. Locating the homeowner in distress, showing how you can help them, gathering paperwork, funding and dealing with the banks and their negotiators (in many cases not quite as smart as a box of rocks) requires a substantial amount of physical and mental energy and can be quite frustrating. In order to make short sales “work”, one must work diligently and persistently. Nothing is made easy for you. My experience with Bill Twyford’s training has been vey positive. I’ve had only GOOD experiences with Bill and Dwan! I just wanted to leave the comment that I have been a student of Bill and Dwan’s since 2008 and I have had only positive experiences with them both. I’ve paid for both Dwan’s and Bill’s coaching, through Skype, and it has been well worth it. They have always gotten back to me within a reasonable time period, and have been able to answer investing questions that I wouldn’t be able to ask anyone else. Because of this, they have helped me answer questions that many homeowners have had for me, so I am able to help them through Bill and Dwan. I know they are two of the busiest people I’ve ever seen, so I can imagine that maybe something could have slipped through the cracks with all the students they’ve coached. I’m sorry to hear that they had an unhappy customer somewhere in the mix, but I just wanted to say, that was not my experience at ALL, and I’m sure I’m not the only person who would say that. 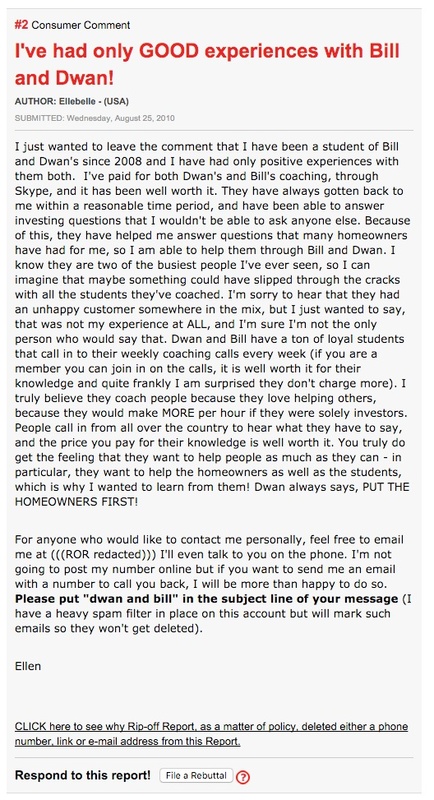 Dwan and Bill have a ton of loyal students that call in to their weekly coaching calls every week (if you are a member you can join in on the calls, it is well worth it for their knowledge and quite frankly I am surprised they don’t charge more). I truly believe they coach people because they love helping others, because they would make MORE per hour if they were solely investors. People call in from all over the country to hear what they have to say, and the price you pay for their knowledge is well worth it. You truly do get the feeling that they want to help people as much as they can – in particular, they want to help the homeowners as well as the students, which is why I wanted to learn from them! Dwan always says, PUT THE HOMEOWNERS FIRST! For anyone who would like to contact me personally, feel free to email me at (((ROR redacted))) I’ll even talk to you on the phone. I’m not going to post my number online but if you want to send me an email with a number to call you back, I will be more than happy to do so.Please put “dwan and bill” in the subject line of your message (I have a heavy spam filter in place on this account but will mark such emails so they won’t get deleted).